Baking and Cooking, the hands down are the most relaxing things to do on my list, both being extremely therapeutic, just like reading a good book or taking a power nap on your sofa after work. When you find what you enjoy and love, life truly becomes easier. I rarely go out to eat, mainly because I enjoy preparing meals for my family and friends, but most of all watching them eat it. With 2 teens in my house, and one more slowly entering the early stages of teenage life, I had to find something, perhaps find myself, and stress less over the little things. I know, sometimes that is easier said than done, but unless you find “me” time, exhaustion hit you like a truck, life becomes the same each day with the one-way route, and 24 hours begin to seem too short to accomplish anything. That’s why I take a step back and do things for myself, by myself just to recharge. Somewhere between laundry, looking for that missing sock, packing school lunches, driving to all after-school activities, you could easily lose yourself. Just last week, I thought to make a nice, stress-free evening for myself and read a book that I have just gotten from the library. Since my husband went to work and our kids were out doing their own thing it was peaceful and I should say, it was a remarkable unwinding evening. I made this lovely tart, brewed ginseng tea and gave me more than 2 hours of quality time. A few years prior that would be almost unthinkable, nonetheless, I am gradually learning more and more how to manage my time as well as give my precious time to the people that are important to me, instead of squandering on the things that really don’t matter at all. Everything begins to fall into place, it is absolutely astonishing how life works if you just take your time and enjoy those simple moments. 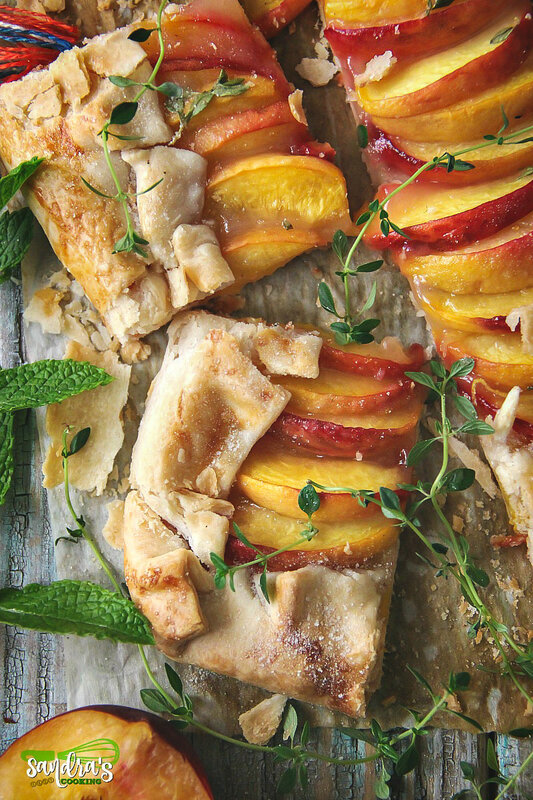 Easy, simple and most definably the best-tasting peach tart. In a food processor, place the flour and salt then process until combined. Add the Organic Vegan Superfood Shortening and process until the mixture resembles coarse meal. Pour about 4-5 tbsp of water in, slowly, one tbsp at the time, steady stream through the feed tube until the pastry just holds together when pinched. Place the pastry on your counter, make into a ball, wrap tightly with plastic wrap (film), and refrigerate for about one hour to rest and chill. Once the dough has chilled enough, remove from refrigerator and place on a lightly floured surface. Roll the pastry into a 10 -13 inch round, then cut into a rectangle by cutting the circular sides. Try to make an even thickness. Keep lifting up and turning the dough disk and a quarter turn as you roll to prevent from sticking to the working surface. Transfer the dough to a parchment paper-lined baking sheet, cover, and place in the refrigerator. Important: You must rest the dough in the fridge to allow the hydration to even out. If after doing that the dough is too dry, use just a bit more ice water. That way the water will absorb evenly and quickly in just a few minutes, allowing you to roll the dough. Use Regular blade in the food processor. You can buy store-bought pie crust. Defrost and use as suggested on the packaging. 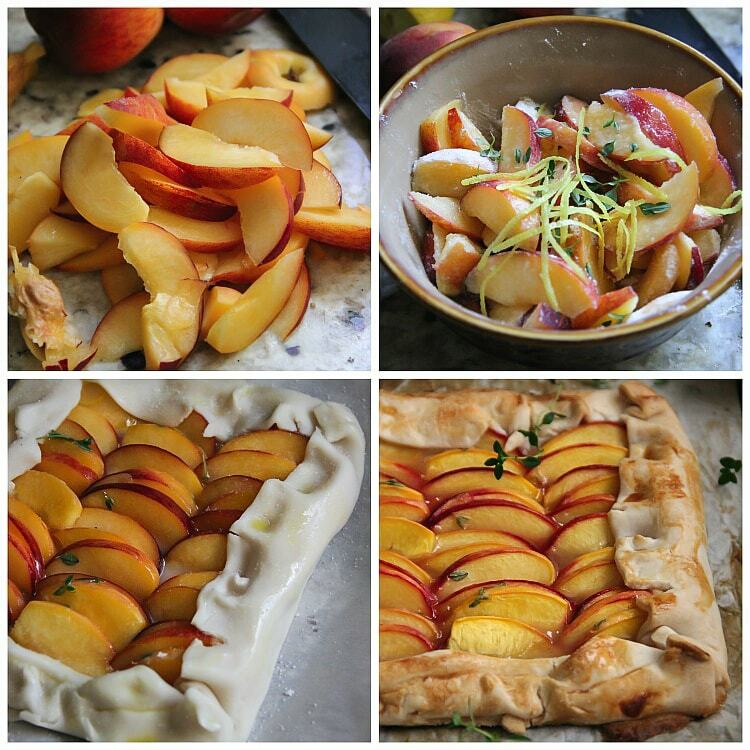 Shape it as you like; as a tart, galette, mini tarts, etc. Wash and gently rub the peaches to remove fuzz (not necessary for nectarines). Cut the peaches in half, remove the pits, and cut into thin slices. Place the peach slices in a large bowl and add the sugar and gently toss to combine, then add cornstarch, lemon thyme (remove leaves from the steam), lemon juice and lemon zest. Toss everything to coat the peaches. Take the dough out of the fridge and dust with a bit of flour and sugar. Just a light sprinkle. 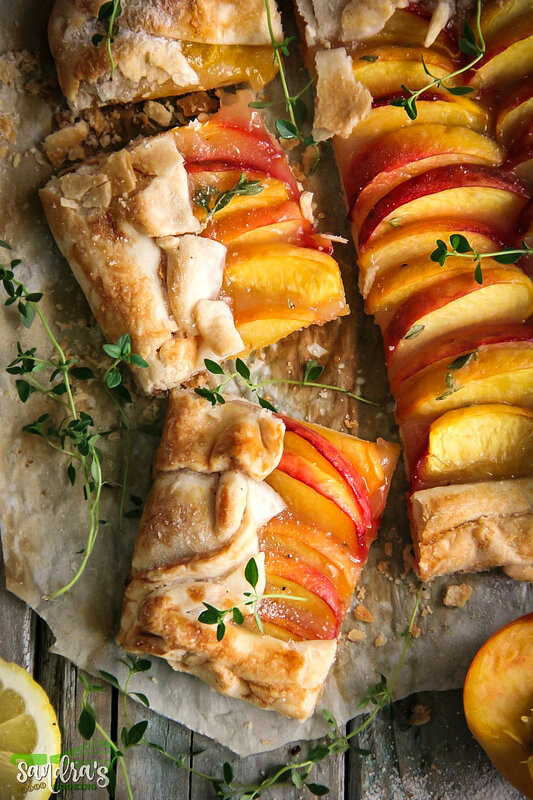 Arrange the peach slices on the dough, placing them close together. You can make double raw or triple, depending on how large you want your tart to be. Leave about a two-inch wide border around the peaches and the edge of the dough. Scrape any remaining sugar from the bowl and drizzle over top of the peaches. Fold the edges of the dough over the peaches. Make sure to seal any cracks in the pastry. You can make it circular as a galette, but this rectangular one is pretty amazing as well. Brush the dough with mixed egg and sprinkle a bit of sugar on the dough. Bake in a preheated oven at 400 Fahrenheit for about 40 minutes or until the dough is golden brown and the peaches are tender. Remove from oven and place on a wire rack to cool down. Serve warm or cold with Ice-cream or a dollop of whipped cream. You may use vegan shortening to brush on the crust instead of the egg. Also, if you wish to use cold unsalted butter instead of the vegan shortening, you can do that too. This is also perfect for nectarines, plums, apples or berries.